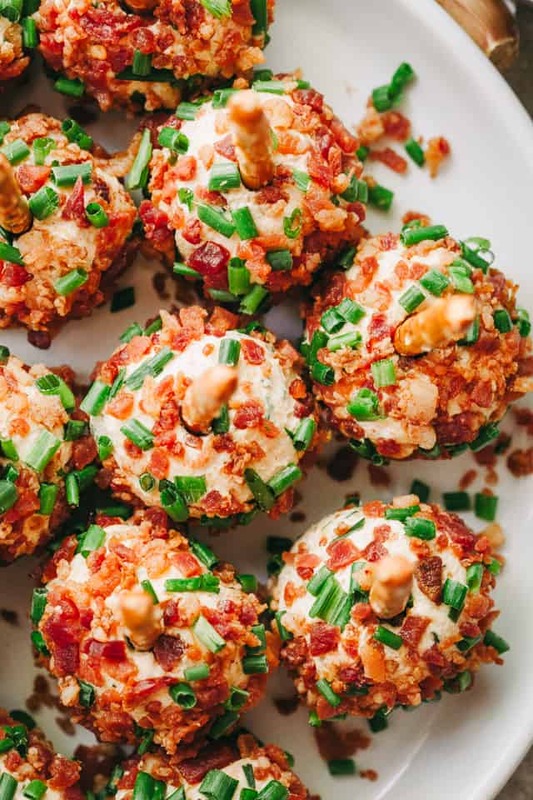 Bacon and Chives Cheese Balls Recipe – Easy, cheesy and bacony bite-size appetizer ideal for your Holiday parties or even game days! Hey ya! Guess what?! Holidays appetizer season has begun, and I am so super excited about it! I quadruple LOVE appetizers. LOVE! A big bowl of food ain’t my thing, but bring on some bite-sized stuff, and I’m all over it. It’s the perfect proportion of darn good food, it’s delicious, and you won’t overdo it. Well… you COULD, but appetizers were meant for sharing, so just stick to that. Can you think of anything better than cheese, bacon, and chives involved in a happy marriage? All rolled up into a bite-sized ball sitting on a pretzel stick?! Srsly, look at how cute they are! This is my love language. Everything good and cheesy and smooth. Like this sweet White Chocolate Cheeseball… oh.my.yum. I don’t often make cheese balls, but I’ve had it on my (mental) food idea board for a long time now and one of the advantages of listing your recipe ideas?! You get tired of thinking about all the things you haven’t done yet which forces you to follow through. Of course, when you sit around on an idea, and finally make it (I made these back in May while working on my Holiday blog-recipes) someone will beat you to posting your recipe because you just HAD TO SHARE your cheese balls in an Instagram story back then (I’m looking at you DELISH – I won’t link to them) and you look like the fool that copied them. But, nope. I came up with these first. Now I feel like a third grader crying about the girl in my class that copied my outfit! waaaah! Okay, I’m over it now. I just had to tell you about it, to get it off my chest. 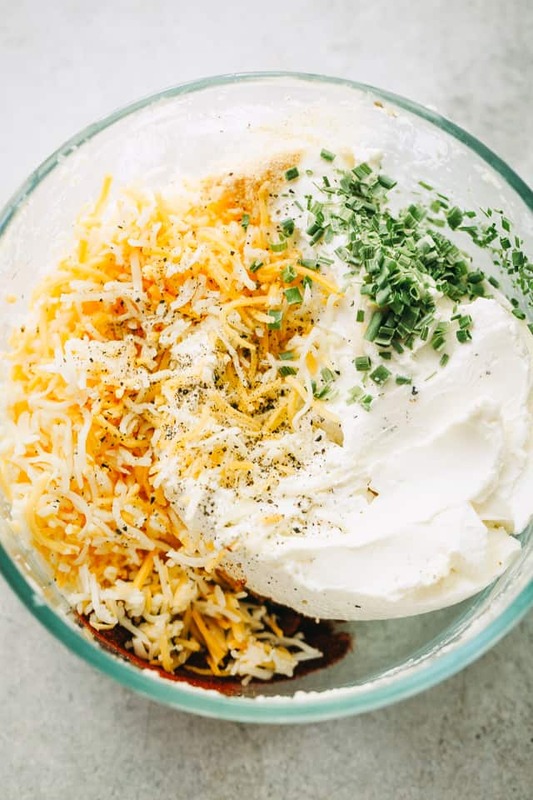 We’re going to combine light cream cheese with a shredded mexican cheese blend, some chili powder, and chives. You will put this mixture in the fridge to chill for a bit so it’s easier to mold it into little balls. To make the cheese balls, I advise you to LIGHTLY spray your hands with cooking spray and get to work. It’s SO much easier to roll anything between greasy hands. Fo’ real. 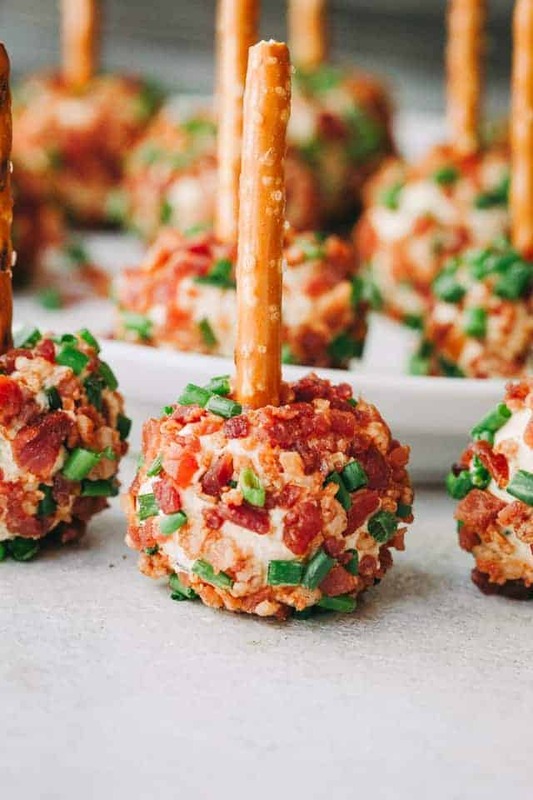 Next thing left to do is pop that pretzel stick on top and roll the balls around in a mixture of bacon and chives. Pop them in the fridge and take them out about 20ish minutes before serving. 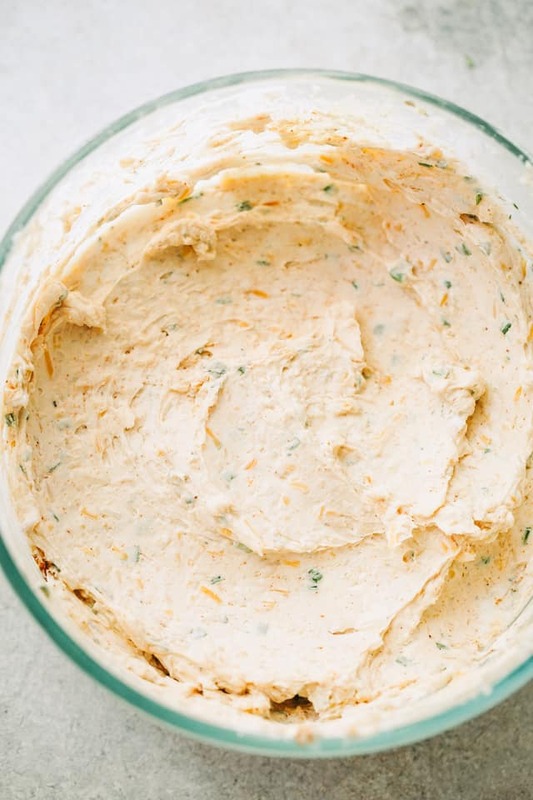 Mix together cream cheese, four cheese, chives, garlic, chili powder, onion powder, salt, and pepper; mix until well blended and smooth. Form into 18 small balls and refrigerate until firm, 1 hour. Remove from fridge; lightly grease hands with cooking spray and form 18 small cheese balls. Pop back into the fridge for about 1 hour. In a shallow dish, combine chopped bacon and chopped chives. 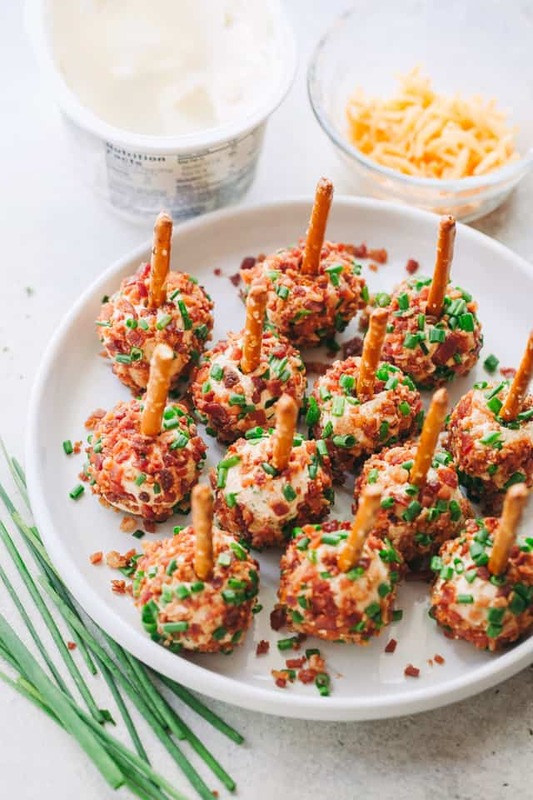 Insert a pretzel stick on each cheese ball and roll balls in the bacon and chives mixture. If not serving right away, please keep in the fridge. Take the cheese balls out of the fridge about 20 minutes before you are ready to serve. New Years Eve Appetizers Ideas | Simple. Tasty. Good. Hello Cheeseballs! Get in my belly! My new favorite thing to add to our gameday spread! This sounds delicious! You had me at bacon! Brilliant idea! 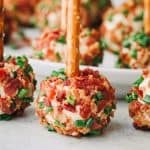 I love anything on a stick and this cheese ball looks amazing! What an awesome idea these are. I’m definitely going to be making these for a football tailgate weekend! Are they large or small pretzel sticks? 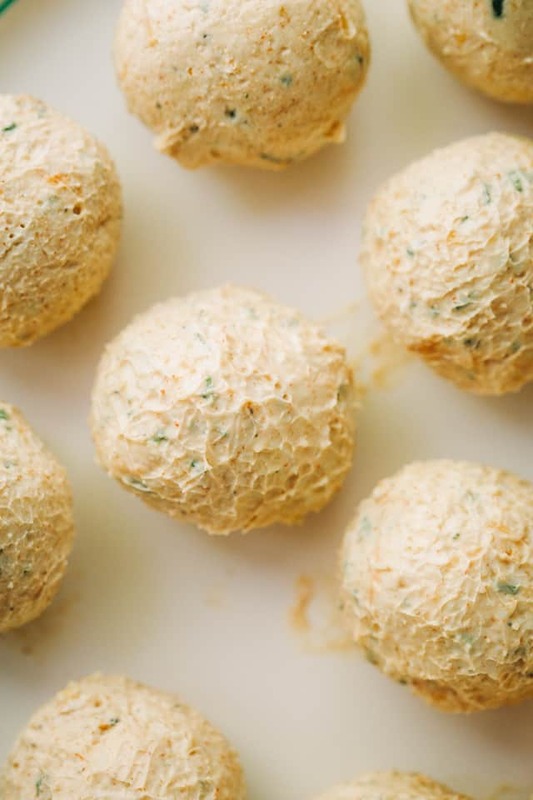 cheeseball in the best tradition, looking for NYE entertaining ideas, these will do, thank you! These look delicious and I can’t wait to try them! How do you think it would turn out if I made these the night before? Do you think the bacon would still be crisp or would you recommend rolling them in the bacon and chives right before serving?? I would probably add the pretzel before serving as I assume that would get soft sitting overnight. Did you try these the night before? Cooks in my community have been making these individual cheese balls for many years. Looking forward to trying with bacon. Yummy I’m sure!! Can I freeze these chees balls? would love to make them for Christmas in advance. Hi!! You can freeze the cheeseballs for up to about 2 months, but I wouldn’t coat them in bacon and chives until you are ready to serve, or after thawing them out. One of the things I am going to make to take to my sons, & daughter in laws on Christmas. But I will need to make a double, no a triple batch! They look sooooo yummy I know they will be a big hit!